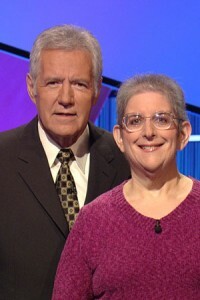 It took three tries, but Ilene Morgan finally succeeded in landing a spot on the game show Jeopardy! in 2012. Morgan, an associate professor of mathematics and statistics, is well-known around campus and in the Rolla community for her expertise at trivia. Members of the Missouri S&T community gathered for a watch party for her Jeopardy! debut on March 5. She finished in second place. Morgan’s pursuit of an appearance on the program has been anything but trivial. Her quest began online, where she played the official version of the game all would-be contestants must complete. In 2007 and again in 2009, her score on the 50-question quiz was high enough to qualify her for a tryout. 29th season. Read more about her Jeopardy! experience at rol.la/whatismorgan.